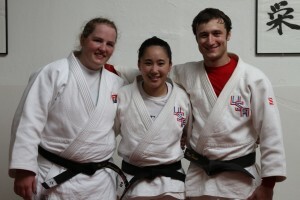 Congratulations to Molly O’Rourke, Annie Shiraishi and Nate Torra for their recent promotion to Yondan (Fourth Degree Black Belt)! On Saturday October 6, Molly, Annie and Nate all performed Kime no Kata for the class. In attendance were special guests Dr. Kuniko Takeuchi and Sensei Haruo Makimoto, both from Okubo Judo Club in Sacramento.